My kiddos love puzzles, and they are great learning tools! Get your little girl this Disney Minnie Mouse Bow-tique 3 Wood Puzzles Set for just $11.14 on Amazon, down from $29.99. Shipping will be FREE with Amazon Prime or an order of $35 or more. 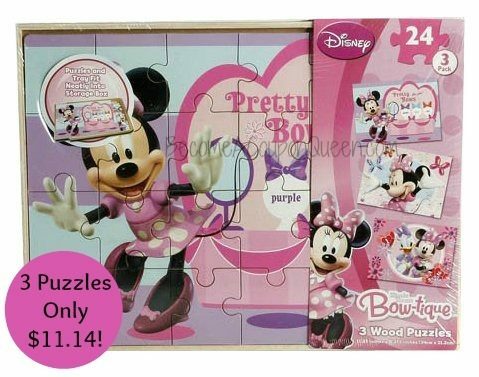 Disney Minnie Mouse Bowtique 3 Wood Puzzles Set contains 3 wood puzzles. Each puzzle has 24 pieces. Puzzles and tray fit neatly into storage box. Completed puzzle size: 11.25 in. x 8.375 in. Your child will have hours of fun putting these pretty Minnie Mouse puzzles together. For ages 3 years old and up.